As far as I am concerned, anything that stays in the ground all winter, dormant, and then pushes up through my nearly frozen heavy clay is almost nothing short of a miracle. Regular tulips can’t do it. In addition to having to contend with having their flower heads bitten off, even before they open, by the herds of deer that roam our property, those that survive get the virus that killed of the tulip trade in Holland in the seventeenth century–the tulip mosaic virus. So my property is clearly not optimal for tulip growing. Instead, I have come to fall in love with the bulbs that come up early and finish quickly. They have a lot to recommend them over their showier cousins like tulips, daffodils and hyacinths (although there are a few hyacinths still tucked here and there from the pots I buy every winter that are forced). One of the biggest advantages is that they do come up before everything else–so they are the first spot of color in the garden. My snowdrops are up as soon as the snow recedes. And while I don’t have many crocus left, they are next. 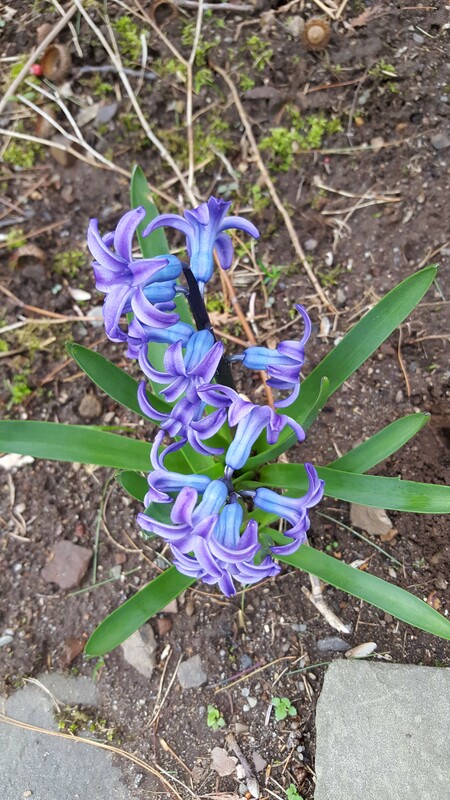 Both these bulbs are incredibly hardy and can take multiple snowfalls and bounce back–nothing to worry about in terms of late season freezes, although the crocuses will eventually flop over and get matted to the ground after one too many snows. 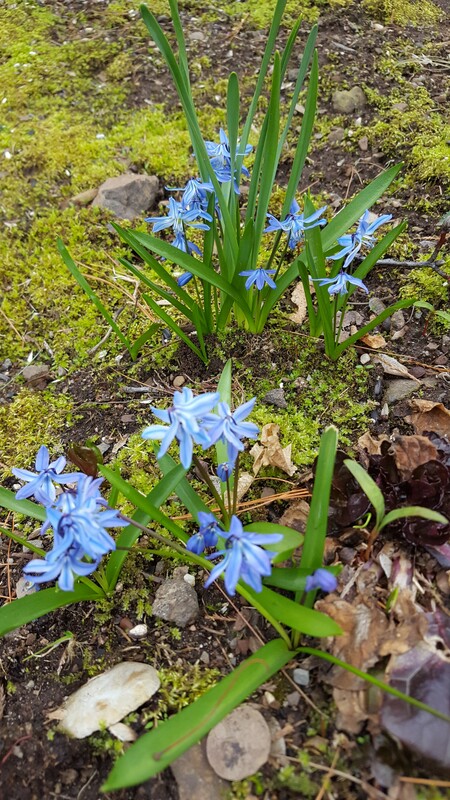 Scilla (blue squill) and chionodoxa (glory of the snow) are next. The main difference between these two bulbs are that in my garden the chionodoxa are slightly earlier and they have a little bit of a tendency to get beaten down by weather. This is because they face upward. 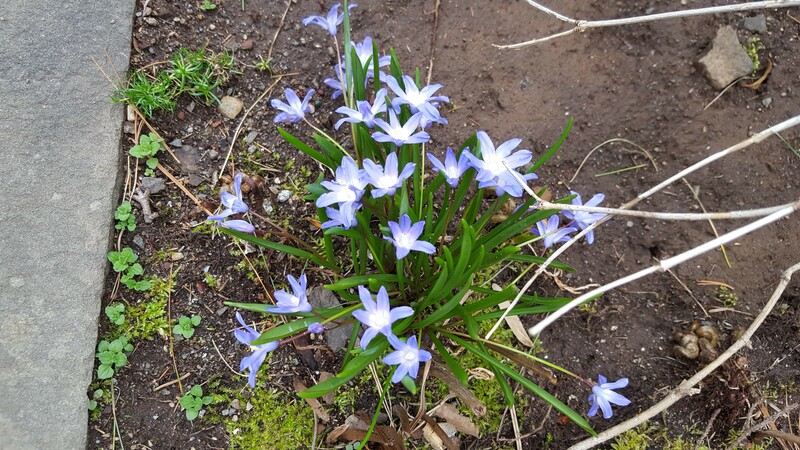 Chionodoxa come in light and dark blue, white and a light pink. Scilla tend to face downward a bit, making it harder to see the actual flowers. But if you get the blue variety, it is a true blue, a color very hard to find at any season in the garden. Scilla come in blue and white. I plant all these bulbs in beds that line my driveway, where I can see them the first thing at night when I return home and the last thing in the morning as I am leaving the house. It is a sure way to brighten your day in the transition from “winter” to “spring,” particularly if you live in a part of the country, as I do, when nature has trouble making up its mind! Previous Article Now You See It….